FA Pete Mitchell finished donning his flight suit in his quarters and grabbed his helmet. He stood and pondered the upcoming mission. He was more nervous than usual. HE shrugged it off, though then motioned for his door to open with his free hand and left his quarters. He turned right down the hall while the door closed. Pete entered the lift and it shot down towards the hangar deck quickly. He was appreciative it was so fast and he didn’t have too much time to worry. He left the lift and made his way to the hangar, where he met several pilots including COL Horus Blackheart, VA Hav Antiel, MAJ Rando, and several others. With that, Pete about faced and headed towards his TIE Guardian. As the TIE Corps pilots exited hyperspace they saw an old platform out in this remote, otherwise vacant sector between EH and RS territories. “I’ve got 12 X-wings on the scanner, headed toward the platform.” MAJ Rando called out. Exiting their TIE’s, the TC team saw a squadron of dusty TIE interceptors, a squad of old X-wings, and a Squadron of Preybird fighters. Just then, the Rebels entered the hangar on foot. “Welcome to our Neutral Ground gentlemen!” AD Carl said. “Preybirds? Seriously?” Asked Pete as he nodded toward the squadron. “Bring it on! We’ve brought our Ace, MAJ Rando!” Challenged Hav. “OK, now I’m listening! Let’s fly!” yelled Pete as he ran off to the interceptors. Later, all the pilots, rebel and imperial hung out in the platform’s mess hall, as it didn’t have a proper bar. First, congratulations to FA Plif! A well deserved promotion! Next, welcome back a veteran, LC Nile Rosenau! He has joined Theta from the reserves. TC folks are still meeting up on Thursdays, though we have changed the time to 8pm EST, 5PM Pacific (I totally forgot this week after a rough week of work). Yesterday (Saturday), the TC and RS joined up for another MP event with the RS. This is now a regular thing at 7 pm EST on Saturdays, so show up to vaporize some rebels! The Hammer’s MSE is now processed, as well. 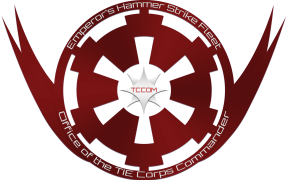 Also, don’t forget to fly for TIE Corps in Battle. There is about a week left. See the assignments below. Come join us on Saturdays, it’s a blast!